How fancy can I make my Boat Registration Numbers? Good question. The strict legal answer would probably be: "Not very"
That being said, we have made 10s of thousands of boat numbers and never heard of a customer getting a ticket for fancy boat numbers. So, don't overthink this. Most States mention they want block letters. But, how do you define 'block'? Some might not consider "Times Roman" or "Copper" block because of the flairs on each letter/number's 'legs'. But really these are the most 'blockish' letters out there. It's possible to order very simple block letters at 3 inches and STILL be unreadable. Especially if you chose a similar second color (shadow / outline) and/or chose a similar color to your boat. So, whatever font you chose, be reasonable. Make sure its readable and you'll have no problems if/when the Officier inspects your boat. On the other hand, give him a hard time and get in his face, and well, you deserve a ticket for whatever he can find. Be nice and enjoy your boat. Have fun! If you really want to make sure you are 'legal' and want to know the 'how and where' to place your new Boat Registration Validation Sticker... Click your State and find out the details. Want to know more? 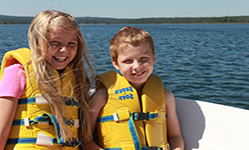 Worried about getting Boat Numbers in time for your trip down to the water? Need help?